It deeply saddens me when I receive unloving comments, from those who claim to be pro-life, about the abortion I had as a teenager. The way our society often causes post-abortive women to feel grieves my heart. Many women (and men) carry the secret of a past abortion for decades because it is a forbidden topic of grief that cripples many with shame and guilt. They suffer in silence because they are terrified of what people might say or think of them, since it was, after all, their choice. Quite frankly, a woman who has had an abortion is often portrayed as one unworthy of love and forgiveness. I am here to tell you that many women, including me, regret our “choice” and wish with our entire beings we could undo it. On one hand, many in our society are busy telling women that having an abortion is the easy solution to their problem of unintended pregnancy – it is their choice and no big deal. On the other hand, still others are blaming women for swallowing these rampant lies and for choosing abortion. Living in a nation that constantly bombards us with messages of “choice,” “rights” and “look out for number one,” why should we be shocked when people actually live by these all-pervasive messages? My belief is that the women who choose abortion are often deceived by the message of “choice” and are not truly aware of the destructive consequences that will inevitably follow such a choice. They hear the voices of those vehemently insisting, “It’s just a clump of cells – not a baby.” If abortion were not legal, I never would have chosen to have one, and I know many, many post-abortive women who share this viewpoint. Yes, abortion is murder, but without minimizing that truth, we must distinguish between the devastating act itself and the woman who allows the act to be performed on her unborn child. We also must take into consideration the confusion created by this form of murder being sanctioned by the law and by much of society. After all, if it’s legal, it must be right and good. We can be pro-life and against abortion, yet at the same time loving, accepting, affirming, and compassionate to those who have endured the heartbreaking tragedy of abortion. Just as Christ doesn’t condone our sin, yet He loves us in the midst of it. We need truth illuminating love in order to be effective in the pro-life movement, as well as in the rest of life. Once post-abortive women grasp that it is indeed “a big deal,” and they come face-to-face with the truth of what they’ve participated in, realizing that not only did they lose their child, but they played a major part in this loss, do they really need pro-lifers piling further condemnation on them, declaring they have no reason or right to grieve? Do they need to be called “baby-killers,” “heartless,” “murderers,” etc.? 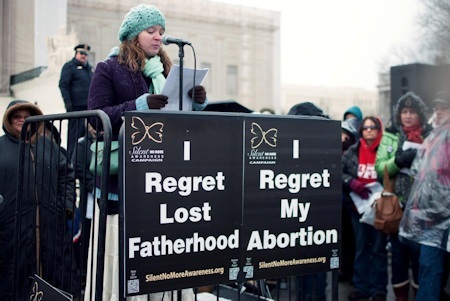 Would we rather women not regret their abortions? Many times when a woman chooses to have an abortion, she is already a broken, hurting person, desperately seeking a quick fix to repair a tough situation. Some pro-lifers find it easy to judge and condemn women for choosing abortion, yet what are they doing to encourage women to embrace LIFE instead? Are the women being supported practically, emotionally, and spiritually during their time of crisis? How easy it is to pronounce harsh judgment when one is not personally faced with such a crisis. The unborn and the women in unplanned pregnancies both need to be fought for. We need to pray and ask for God’s heart for both sides because He has a plan and purpose for both and loves both equally! Being pro-life means being pro-every-life. When I was faced with an unintended pregnancy, my parents, unhesitatingly, welcomed me back home with open arms. I pray that the Christ-like way they loved me will be an example to others on how to respond positively to women facing similar circumstances. Women who do embrace life need to be supported and commended for their choice. How easy it is to talk as if one is pro-life, when one has all of the answers but none of the problems. When I was pregnant, and unmarried at the age of 19, with my daughter Lily, I felt ashamed when questions seemed to appear in the eyes of outsiders as they noticed my growing belly. I wondered if, in their judgment, they found me undeserving of love, affirmation, and forgiveness. It seemed as if people were looking for a wedding ring on my finger. I think the fear of such harsh, undeserved judgment is the reason many choose abortion. How easy it is to cave in to the lie that it will be easier to live with that tragic secret than it will be to face the hateful shunning and unforgiveness of others. Women are judged if they choose abortion, yet they are also judged if they choose LIFE. I pray that pro-lifers will learn to respond with love and mercy to those in unintended pregnancies, as Jesus responds to each of us in our sin. Rather than freely exhibiting disdain to the women who are suffering, possibly alone, in their painful situation, from which they see no hopeful escape, forgiveness and unconditional love need to shower them in abundance. May we show others the very mercy that Christ has shown us, instead of kicking the wounded when they are down. Abortion is not the unforgivable sin, though humans may attempt to place it in a category of it’s own. God is mighty to forgive and wash us clean of each and every sin, if we humbly repent and turn from it. Pro-lifers should be grateful for the empowerment of the witness of those who have awakened to the truth of the wrong they have done. Who better to testify to the ravages of abortion than those who have endured such tragedy? My desire is for other post-abortive men and women to know they are not alone. To know there is healing to be found in Christ and that He alone can wash them white as snow, as if they had never been involved in the selfish sin of abortion. When you turn to God in genuine repentance, He is faithful to forgive, and He remembers your grievous sin no more! Don’t allow the lies of others, in their attempt to keep you continually burdened under their unforgiving condemnation, to shame you. I want others who have endured the pain of abortion to know that it’s normal and healthy to grieve for your missing child. In fact, it’s necessary! Don’t let anyone tell you otherwise! Allow the Lord to bring beauty from ashes, weaving this together both for your good and His glory. Though my deeply personal pain is hard to share, no matter what anybody says to or about me, I refuse to remain silent, for I would be irresponsible in doing so. I will love my babies into Eternity and I will keep my promise to them that I will be their voice, as long as there is breath in my body.